Home 2018 February 8 When does a person become an adult? Basically, there isn’t a whole lot of reasoning behind the ages put into place in America allowing certain privileges and taking away others. The legal age of adulthood is 18, yet the drinking age is 21, and you can’t rent a car until 25. These various ages are mainly results of different lobbying groups over time. The adult age of 18 came around when the Vietnam War protests were going on. The legal voting age was lowered due to the national unrest, but so was the age for being a legal adult. Young people felt that if they were old enough to to be sent off to war they were old enough to vote. The 26th amendment was passed, allowing citizens to vote at the age of 18. Is 18 the right age? At 18 young people are expected to quickly gain a ton of independence, although there is a whole lot that they may still not know. For kids with subpar upbringings this can be an especially hard leap, as they may not have the same mentoring that a child with a more stable home could have. Kids raised in foster care systems for example are expected to care for themselves upon turning 18, and can no longer receive aid from the state. There is a time in each person’s life where they have to become self sufficient, but there is a range of ages for when a person will be prepared for this transition. High schools teach students many things, but often times real world subjects such as paying taxes, applying for jobs, and managing a budget are looked over, leaving students to either learn on their own or rely on their parents to continue to help them. Another major consideration is the brain development of a young person. Today we know that the brain isn’t finished developing at 18, and that some parts aren’t finished developing until around 25. The areas of the brain involved with rational and long term thinking are still forming in teens, differing them from older adults. This relatively new information makes it hard to decide when the legal age of adulthood should lie, but it seems as if rental car companies are doing something right. So the question lies – should the age of becoming a legal adult change? 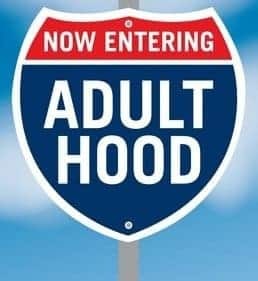 When does a person become an adult? by Ed is licensed under a Creative Commons Attribution-ShareAlike 4.0 International License.